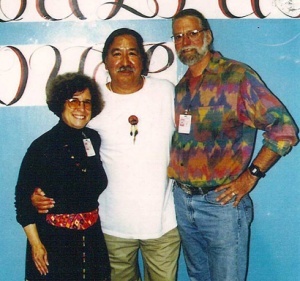 Reid Jenkins , a member of Metro Atlanta Democratic Socialists of America, has coordinated support in the Atlanta area for Leonard Peltier’s "fight for justice for Indian people since the early 90’s". Reid is married to Barbara Joye. Metro Atlanta Democratic Socialists of America elected a full slate of 13 delegates and 2 alternates to represent the group in August 2017 at the Democratic Socialists of America's National Convention! The delegates: Jeb Boone, Adam Cardo, Scott Douglas, Anat Fintzi, Chad Floyd, Daniel Hanley, Barbara Joye, Brad Lathem, Erin Parks, Eric Robertson, Maxwell Ruppersburg, Ron Spears, and Matthew Wolfsen, and alternates Reid Jenkins and Tom Ladendorf. March 2018, several Metro Atlanta Democratic Socialists of America members turned out to support the Grady H.S. students who walked out as part of the nation-wide protest demanding effective gun control legislation in the wake of the Parkland, FL massacre. It seemed that the whole school, including teachers and the principal, participated in the demonstration, which they held in the Grady sports stadium. After a moment of silence a few students gave brief, eloquent speeches and then the whole group marched around the track a few times before returning to classes, well beyond the announced 17 minutes. Barbara Joye, Reid Jenkins, Evan Seed, Lisa Ashway, Lorraine Fontana, Cecelia Cantrell and Ann Mauney were there from MADSA; Cecelia Cantrell, Lorraine Fontana, Ann Mauney and Barbara Joye were also members of Atlanta Grandmothers for Peace, which had brought many of the supporters. This page was last modified on 27 March 2018, at 06:25.